On the afternoon of Day 4, we ran into Chris Olds of Beckett Media @chrisolds2009 and asked if he’d be down to do a Radicards episode with Dan G. of www.sportsecurities.com; @SportSecurities and I, and he said sure. We were pretty excited about that so we took a brief look at the various wax vendors before we called it a night. By the morning of Day 5, Dan found an affordable box of 1997 UD3 Baseball so we grabbed that and headed over to the Autograph Pavilion where we all agreed to meet to film the episode. Watch the video. This was a fun break for us and one that took us back to a different time. 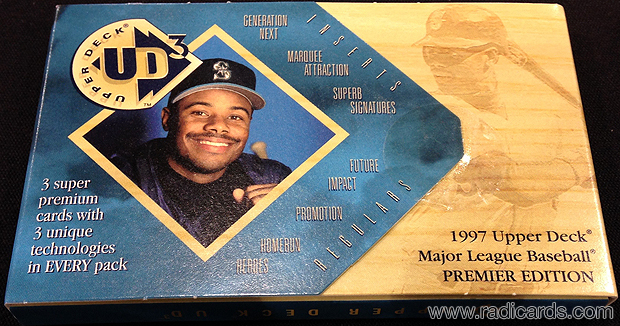 1997 UD3 Baseball was released during a time when insert cards featured simple but attractive designs and showcased key star players. This was my first time opening this product and peeling cards. Alex Rodriguez 1994 Sportflics Rookie/Traded Artist’s Proof : I collect Artist’s Proof parallels of various products from the ’90’s and this particular ARod is an ultra valuable card. I don’t have one and always wanted to see one in person so I had to take a pic of this PSA 10. Barry Bonds 2000 Pacific Prism Proof /10: This is the first of its kind I’ve ever seen in person so holding one in hand was a great experience. These are blank backed and carry an elusive print run of just 10 copies. Jose Canseco 2000 Vanguard Holographic Purple /10: Only 10 copies exist and this one carried a hefty price tag. While I’m not in the running, I’m fine with this photo. These are beautiful cards. Kris Bryant 2014 Bowman Chrome Prospects Blue Refractor AU /150: Being in Chicago this year, I expect to see many Kris Bryant cards. I was joking with Dan that I think every Kris Bryant card, literally ever serial number in ever print run was housed under the roof of the Donald E. Stephens Convention Center this year. I was being facetious, of course, but I did see a ton of them. After seeing so many, you kinda lose a little of that hobby romance. Well, when we saw this beauty with the coveted BGS Black Label (all 10 subgrades – a literal perfect card), that romance was instantly reinvigorated. I had to snap a shot for the archive. 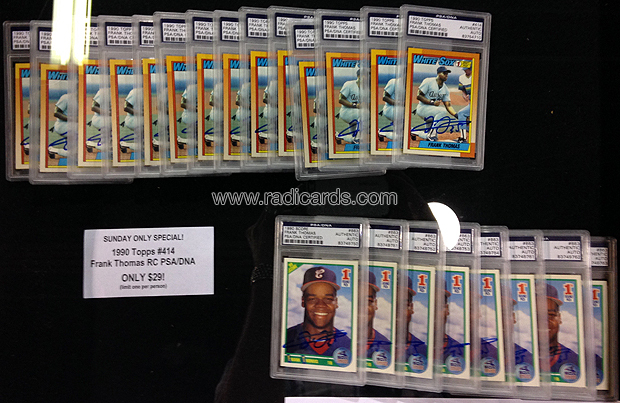 Here are some important rookie cards that one dealer had that I thought were just fantastic. Joe Montana 1981 Topps PSA 10: Given that a good many of these suffer from centering issues, I had to have a photo of his gorgeous example. Derek Jeter 1992 Little Sun High School AU PSA 10: Surely a first ballot Hall of Famer, Derek Jeter’s pre-rookie cards will continue to appreciate with time. This card is top shelf for any advance Jeter collector. Ken Griffey Jr. 1988 Best Platinum PSA 10: This is a huge card that you don’t see too often in any condition. Here’s one in top grade condition. Tim Duncan 1997-98 Topps Chrome Refractor BGS 10: With more attention on ’90’s basketball inserts and rookies, this card is one of the leaders of notable rookie refractors. I had to get a pic of this Pristine example. JP Cohen of the always impressive Tustin CA based auction house, Memory Lane Inc. was kind enough to let me take some photos of pieces on display at his booth. I was really impressed with this group of high grade 1954 Red Hearts . 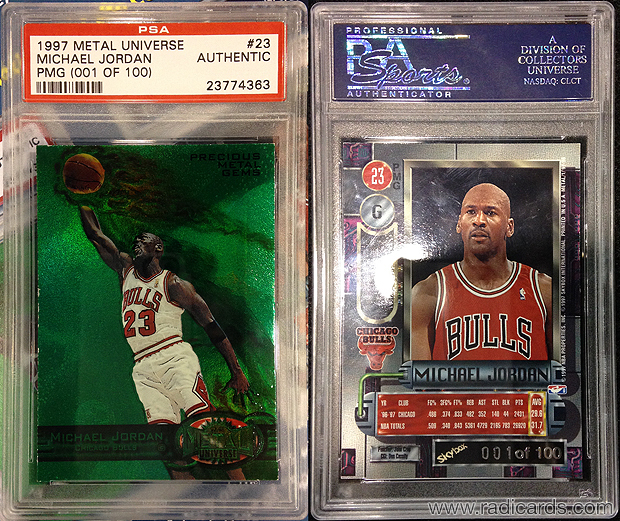 Michael Jordan 1997-98 Metal Universe Precious Metal Gems Emerald /10 (First 10 copies in a print run of 100): BBCexchange had this card on consignment with an eBay auction that ended on 8/2/15. The closing price for this card came in at a whopping $91,300. The serial number is of huge significance as it’s the first in a print run of 100 with the first 10 copies being emerald parallels, and the remaining 90 being ruby parallels. This may be the most, if not one of the most significant ’90’s basketball inserts. Steve Heart of BBCexchange was kind enough to pull it out of the display case so we could have a closer look of the front and back. 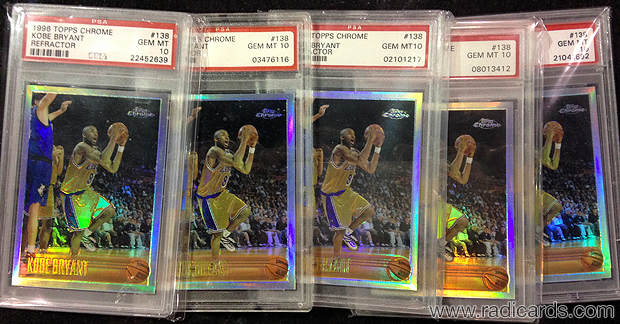 In-hand, this card is a true gem. I had to take a few pics. These photos were an excellent conclusion to another great day at the 2015 National Sports Collectors Convention. It was really incredible seeing such beautiful examples of important cards in a volume that is hard to match in other mediums. Seeing some of this stuff in person is a great opportunity. I always get so surprised when I see vintage cards in such high grades. I’m left to consider how these cards survived in such great shape after all these years. It’s quite something. That concludes another year of the National Sports Collectors Convention. Thanks to Chris Olds of Beckett Media for hanging out with us. We met great people, shared interesting dialogue, and saw a lot of rad sports cards. Thank you for reading and watching my day to day recaps. Enjoy collecting!